The flower arrangers are a voluntary team with great skill and enthusiasm and work hard to make our church look lovely at the main festivals, smaller events and especially weddings. We follow the same procedure for every wedding. Our wedding administrator gives us advance notice, giving us plenty of time to forward plan. First the meetings with the bride and groom to discuss their special wishes, and then in good time before the wedding we purchase the flowers and accessories. 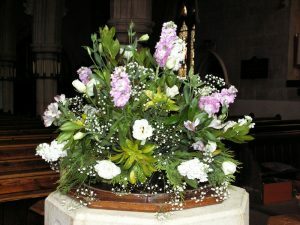 The festivals of Harvest, Easter and Christmas are, of course, very busy times for the flower arranging team and the congregation contributes generously for the provision of flowers for these events. The flower arranging team also contributes to the Christmas Fair. The Brownies usually join us for posy making for Mothering Sunday. During the service all the children give out the posies to their mothers and the other ladies in the congregation. Male or female, if you would like to join our team of arrangers, we would be delighted to welcome you. Please contact me through the Parish Office.